The Edland is a machine that is so rare, that it is a machine of almost mythical proportions. The machine was designed by one Joe Edland of New York and marketed in 1891 by the Liberty Manufacturing Company of New York. Until quite recently, it was believed that no machines had survived 'in the wild'. In 1965 American collector and typewriter historian Paul Lippman was informed about the existence of an number of mint Edlands found in a warehouse. In 1965 six machines were acquired by Oregon collector Joe Updegraff, all brand new and wrapped in newspapers. Later some other machines showed up, in two different versions even, with embossed and printed circular indexes. The total number of Edlands known now (early 2002) is 9 with embossed indexes and 2 with flat indexes. 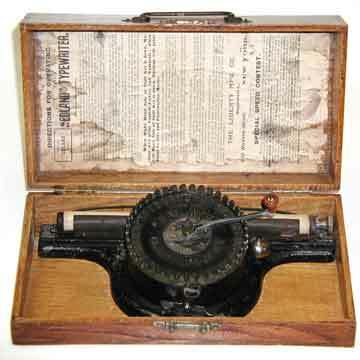 The Edland was a cheaply made daisy wheel machine (pic 5). The pointer was turned to select the right letter and pressed to print. The shift key in front of the machine could be pressed to the left or to the right for capitals or figures. The Edland company trusted the qualities of this cheap contraption. On the instruction card on the inside of the lid (pic 1), Liberty announces a speed contest on the Edland machine, because it would prove that this was the fastest single key typewriter in the world.